We raised our plastic cups and tossed back a thimbleful of pungent rice wine as our new Vietnamese fishermen friends roared with laughter. “Một hai ba, yo!” they shouted in unison in the words of the traditional drinking toast. Flashing their rotted teeth while hauling out enormous buckets of home-brewed alcohol, they communicated without speaking a word of English (or we of Vietnamese) and the moment was perfect. Just hours earlier, my husband and I had been lounging on a luxury junk, consuming gourmet food and gazing at breathtaking scenery. Now we were hanging out on a rusted floating dock in a fishing village with a bunch of gnarly fishermen after an afternoon of kayaking, searching for clams and picnicking on a deserted beach. 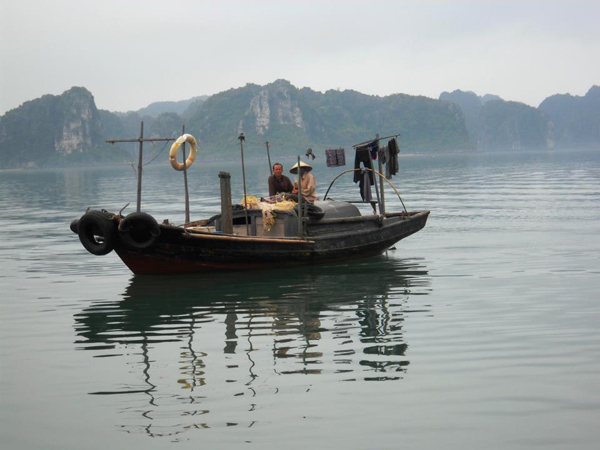 Such are the contrasts of Halong Bay. This World Heritage Site, located 170 km from Hanoi, offers a little of everything; from the sublime to the ridiculous. You can cruise on a lavish boat with air-conditioning, sumptuous furnishings and epicurean delights, spend a few hours on a crowded vessel, chugging beers and jumping from the top deck and anything in-between. But the common denominator remains the same: an exquisite location where massive fragments of jagged limestone islands scatter the bay, dwarfing tiny fishing villages and piercing the horizon as far as the eye can see. It’s a destination which is in huge demand by visitors to the region (with 420,000 people visiting in the first three months of this year). Pillars of limestone, once the supports of underground caves, rise sharply from the water while gentle mists linger over the bay and tiny sandy beaches peek through craggy archways. Five hundred million years in the making and twenty million in the shaping. Sadly, it’s also showing signs of being over-touristed. While stunning vistas and tranquil waters provide the backdrop for a unique trip, that same tranquil water is, in places, coated with a slick layer of oil and littered with the remains from yesterday’s boats. 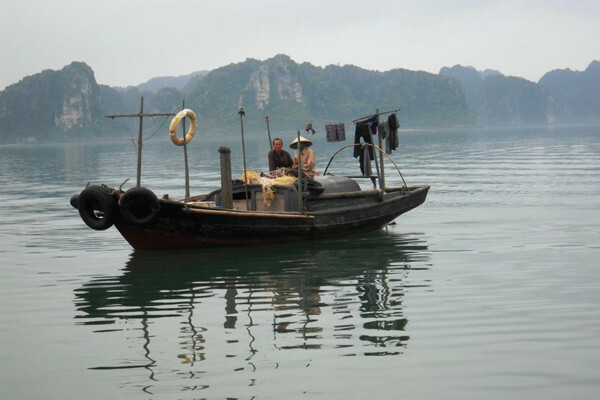 What to see and do at Halong Bay? 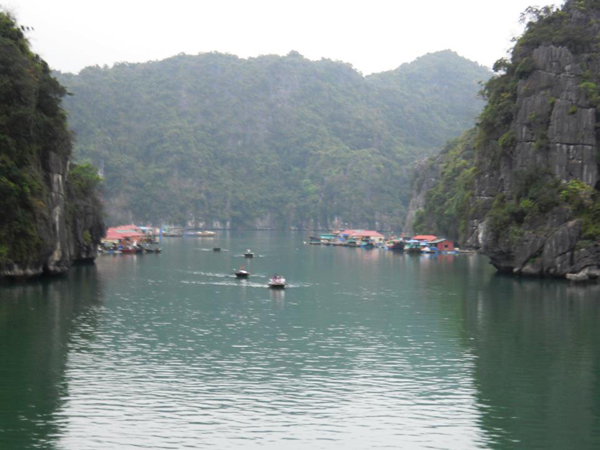 Nevertheless, Halong Bay offers many delights for a brief encounter with nature. We chose to spend three days on board the Santa Maria, one of the more upscale junks, since we didn’t anticipate a return trip in the near future and wanted to get the full experience of the bay. We also felt three days would give us the opportunity to get more than just a fleeting glance and to participate in activities as well as relax and enjoy the journey. As with many of the cruises, ours offered good food, air-conditioned cabins, a relaxing upper deck with padded lounge chairs and experiences such as visits to a fishing village, beachfront picnic, cave exploration and kayak paddle.We also discovered that the Santa Maria took the road less travelled – that is, it cruised through Bai Tu Long Bay instead of the much-touristed Halong Bay (every bit as beautiful and much less trafficked than its well-known neighbour). Our first day started after we boarded the boat around noon when we were served a sumptuous five-course lunch, explored the boat, lounged on deck and visited the fishing village. The following day, we parted company with the two-day cruisers and climbed onto a small motorized fishing boat where my husband, Skip, and I, our two French Canadian companions, Martine and Sophie, and Vietnamese guide, Tuan, became part of the crew. About 30 minutes after pulling into the bay, we found ourselves learning the fine art of local fishing techniques. The captain hauled meters of fishing net overboard as the boat made circles in the water, dragging the net behind it. The crew handed us short wooden sticks and we spent the next five minutes beating a bamboo pole which was draped across the boat as if our lives depended on it. Contrary to western fishing techniques where you need to keep silent, here it’s customary to make noises loud enough to scare the fish into the net. It worked and, before long, we had a boatload of small fish destined to be part of the meal at our picnic lunch served on a private beach later that morning. While the Santa Maria may not be typical of the boats which ply these waters, it’s just one of 350 vessels which visitors can choose from. Looking for karaoke and drinking games? A luxury suite with a personal butler? A family-style cruise with a trek on Monkey Island? They’re all there. You’ll also find excursions to fascinating and beautiful spots around the bay, many with magical names that are hard to resist. There’s Surprise Cave, one of the widest grottoes in Halong Bay where thousands of stalactites and stalagmites punctuate the space, Cave of Wonders where a series of steps lead into a huge space flooded with natural (and electric) light and Castaway Island with stretches of golden sand. And, depending on your choice of boat, you can take a cooking class, get an onboard massage, practice tai chi or laze in the sunshine. Super-budget party tours are often low-cost drinking tours and can be as cheap as $35 per person for a two-day cruise. Budget tours are for people requiring less luxury. Two-day tour $50-$75; three-day tour $60-100. Luxury tours offer upscale amenities and good food. Two-day tour $80-$150; three-day tour $150-$250. Super-luxury tours offer increased luxury and unique itineraries. Prices can be up to $2,000 for a private suite. But, most importantly, don’t get attached to the outcome. 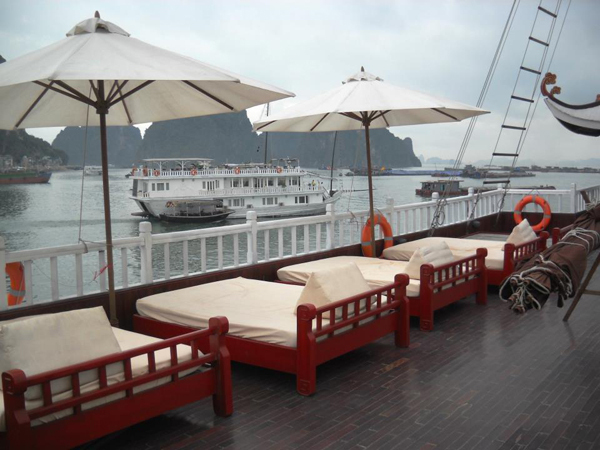 Halong Bay is an exquisite gift from Nature so sit back and enjoy the ride.